SVF, Eastern India’s leading entertainment company, has moved to a brand new office at Acropolis on Rajdanga Main Road, Kolkata. The move marks a new journey for the group. Shree Venkatesh Films has recently been renamed as ‘SVF’. “Our journey over the last 20 years has been a roller coaster ride. Starting with a 150 sq ft office, we worked day and night to reach where we are today. Each and every member of our team has been instrumental in our endeavour. It is the consequence of a collective dream, a journey we take pride on, with humility and passion. The entire team is brimming with renewed energy ever since we shifted to our new office. The new workspace will definitely act as a catalyst to our growth plans”, said Mahendra Soni, Co-Founder & Director, SVF Entertainment Pvt. Ltd. 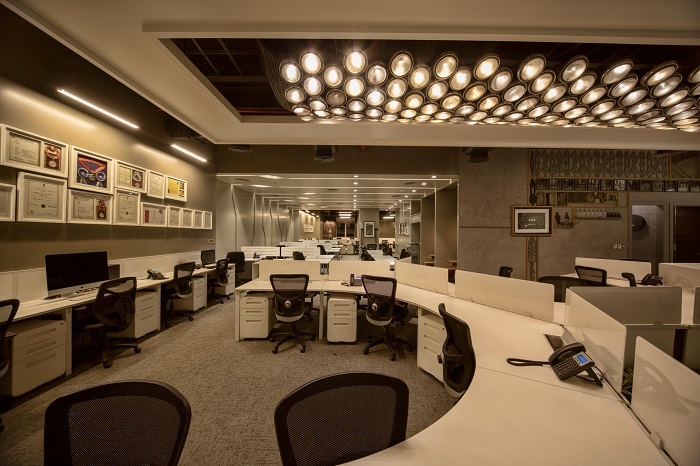 Renowned artist Narayan Chandra Sinha has conceptualised and designed the aesthetic new workplace. The eccentricities of his creations evoke a sense of ‘Bangaliyana’ intertwined with global sensibilities. Located on the 17th & 18th floor of the skyscraper, above the mall, the 25,000 sq ft plush office is a visitor’s delight. In the reception area, a stunning chandelier made of trumpets with a shiny brass finish welcomes visitors. Intended to preserve the magic of celluloid, the projector, a symbol of a bygone era is carefully sourced and utilized as a reception desk. This element from the past creates an ethos of modernity. A tinge of orange filament light bulbs on a C-Stand creates a picturesque cityscape of Kolkata, the city of joy. SVF is Eastern India’s largest native media and entertainment conglomerate, having business interests in Film Production, Television content Production, Film Distribution, Digital Cinema, Music, New Media, Cinemas and Equipment Rental. SVF has successfully produced over 110 films including national award winning ‘Chokher Bali’, ‘Raincoat’, ‘Memories in March’, ‘Apur Panchali’, ‘Chotoder Chobi’, and ‘Chander Pahar’. SVF’s next biggest venture is Hoichoi, a one-stop online destination for Bengali entertainment – an on-demand Video Streaming Website and App – with over 500 Movies, Songs and original series.